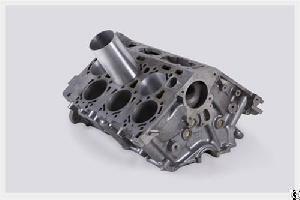 strength, heat stability and high abrasion resistance.In recent years, AlSi alloy has a fast development in many applications, it has been widely used in automotive, motorcycles and military industry, for example, the wear-resistant components like pistons, cylinder liners and brake discs in tanks, motorcycles and cars.Using aluminum alloy engines is the important direction to replace cast iron engines and cast-in iron cylinder liner engines. Nowadays, AlSi alloys are widely used in automotive industry.Many famous automotive companies have adopted AlSi alloys in automobile engines, such as Mercedes-Benz, Mazda, BMW, GM etc.Compared to the traditional casting cylinder liners, application of AlSi alloy cylinder sleeves is the tendency of automotive industry in the future. The good compatibility of thermophysical properties between AlSi alloy cylinder liners and aluminum alloy pistons could realize �no clearance cylinder�and �all-aluminum engine�, which will reduce the risk to avoid the failure of piston thermal etching�burn the top�, cylinder score�and�cylinder sticking�.AlSi alloy has been the main material of new type automobile cylinder liners. AlSi alloy cylinder liners could lower oil consumption, having properties of anti-vibration, noise damping and high thermal conductivity. The weight of AlSi alloy cylinder liners is much lighter. Because of the low density of AlSi alloy in automotive industry, 1 kg AlSi alloy could replace 3 kg castings. The application of AlSi alloy cylinder liners increases the power density of engines, which makes the overall properties much higher and output power be raised at least 15%.